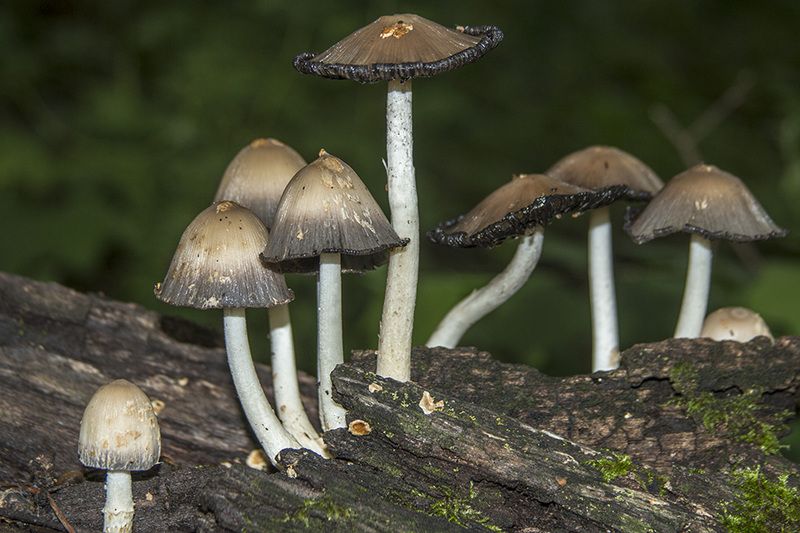 Mica Cap (Coprinellus micaceus) is a very common mushroom in Europe, Asia, Africa, and North and South America. In the United States is seen from coast to coast. It occurs from April through October in forests and woodlands, in suburbs, in urban areas, and sometimes indoors. It grows in dense clusters on decaying stumps and logs, and sometimes on the ground on buried wood. When young, it is dome-shaped, yellowish-brown, and covered with glistening particles. As it matures it flattens out, the particles wash away, and the cap becomes gray at the margins. As the mushroom ages the cap turns black, the margins become tattered, and the gills dissolve into an inky black liquid that drops to the ground. This entry was posted in Fungi and tagged Coprinellus micaceus, Mica Cap on July 16, 2018 by John Valo.